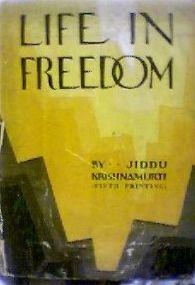 Life in Freedom by Jiddu Krishnamurti is a compilation of early addresses given in Benares, Ojai, and Ommen during 1928. Freedom, as Krishnamurti puts it is not the end but the beginning, the beginning of life in reality. I have been reading the works and talks of His Highness J.Krishnamurthy since my early student life (last over 45 years).Like his personality, his words too lit my heart. I deeply feel indebted to this Great Enlightened Soul of Mother Earth Gifted the Humanity.